The largest and most affordable Online Bicycle Carrier - Rear Mount Shop! 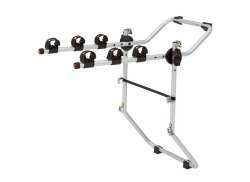 Bicycle Carrier - Rear Mount shop the largest and most affordable! Do you want to buy a Rear Mounted Bicycle Carrier online? Hollandbikeshop.com is the online shop for all your Rear Mounted Bicycle Carriers. No tow bar? No problem. You can also transport your bicycles by using the fifth door or trunk lid of your car. There is a number of practical systems, invented for easy mounting on the back of the car. The bicycle carrier is mounted on the car with special mounting parts and is equipped with a rubber coating to protect your car. You should however make sure that your tail lights and license plate are still visible. If not, you'll have to purchase additional lighting. These bicycle carriers offer room for a maximum of 4 bicycles. 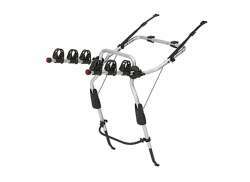 At Hollandbikeshop.com you can find a wide choice of Bicycle Carriers for Rear Mounting by brands like Thule. In our wide Bicycle Carrier Rear Mount range on Hollandbikeshop.com you can find the bicycle carriers for rear mounting in various sizes and models, suitable for several car brands and models. So you'll surely find the Bicycle Carrier Rear Mount you're looking for! Hollandbikeshop.com is dealer of Bicycle Carriers for Rear Mounting and has a large and affordable range. We also often have Bicycle Carriers for Rear Mounting on sale or in our outlet, so keep an eye on our sale button. The largest and most affordable online Bicycle Carrier - Rear Mount shop!